This is adaptation of the Wright Book, “If You Meet a Dragon. Glue a turkey cutout (I used an Ellison die-cut turkey) to each page. 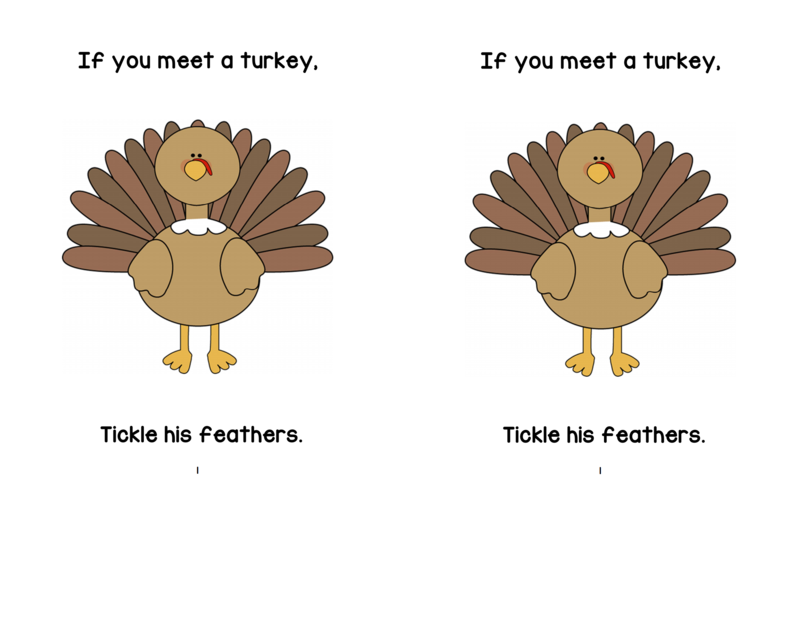 Use a real feather to “tickle” the turkey on each page. Make a pocket for the inside cover of the book as a place to store the feather. On the last page, cut the turkey in half vertically and glue to the right edge of the page so it appears the turkey is running away. Make a class book by doing an interactive writing sentence to illustrate each food the old lady ate. For example, “She ate pie.” (Let the children help compose and sound out the words for each sentence.) Students collaborate to draw food pictures for each page. There is a storytelling apron that students can wear and feed the food pieces to the old lady. This apron can be purchased from Lakeshore Learning. I used photos from this to illustrate each page of our book. Here is a printable graphing activity for I Know An Old Lady from Pre-K Pages. I eat Corn Flakes for breakfast. I eat corn dogs for lunch. I eat corn on the cob for dinner. I eat popcorn, crunch, crunch. I eat corn muffins for a treat. I eat candy corn, how neat. I think corn is good for you. I give thanks for corn, don’t you? “_____, ______,” (oink, oink) said the turkey. This is an adaptation of the book, Cookie’s Week. Make up a story about a turkey and the days leading up to Thanksgiving. On Sunday, Turkey ran away from the farm. On Monday he flew to Hawaii. Indian, Indian, What do you see? I see Plymouth Rock, waiting for me. I see a teepee close by the sea. I see some Pilgrims standing near me. A Thanksgiving Day dinner is what we spy. This is a factual book about turkeys. The booklet is round in shape and you add a few touches to make the cover look like a turkey. Two plastic forks are taped to the back of the book. The prongs hang down at the bottom and look like the turkey’s feet. Adorable! Make an old lady by enlarging a basic shape of a woman. Cut out her mouth and her belly and laminate her. Hot glue a clear garbage bag to the back of her mouth that hangs down to her belly. Make pictures of each food item in the story for the kids to use to feed the Old Lady. You can also make a word card (pie, rolls, cider, etc.) to feed her after they feed her the food pictures. Later the kids match the food word to the picture. Make enough food pictures (like three pies, three rolls, etc.) so several kids come up when it’s their turn to feed the old lady. I also made individual “old ladies” for each student by taping a ziplock sandwich bag behind her cut-out mouth. They each had miniature food pictures to feed her for retelling the story at school and at home. Program cut out feathers with words or letters that need reinforcement. Seat children in a circle on the floor. Fan the feathers in your hand as you strut around the circle chanting, “Tom Turkey was strutting all around ’til the wind came and blew his feathers down.” On the word “down”, toss the feathers into the air. Each child picks up a feather and returns to his place in the circle. Students read what is on each feather. The game can continue with a student playing Tom Turkey. Give each child a lunch bag with a turkey cutout attached to the front. Program index cards with words or letters that need reinforcement. Place cards in the center of the playing area. In turn, players draw a card. If they can read it, they “stuff” their turkey with the word. Play continues until all of the cards are used. Students count the cards in their bags to determine the winner. Stuff a lunch bag with newspaper and staple shut. Attach a turkey cutout to one side of the bag. Hang the bag turkey by a string suspended from a chart stand. Play a flashcard game and give each child a beanbag to toss at the turkey if he can read the flashcard. Attach a turkey body to a construction paper background. On the body, write, “I am thankful I can read these words.” Write words on feathers. Students can glue on feathers of words they can read. This is a book of poems and this website has a lesson plan and pictures of what Pilgrims were grateful for. This website has a lesson plan and rhyming picture cards of items from story. Hi and thank you for your wonderful website! I have gotten many great ideas from you. I am wondering if you have the Tell Me About Turkeys book that I could use. I’d love to do this with my kinders this month.